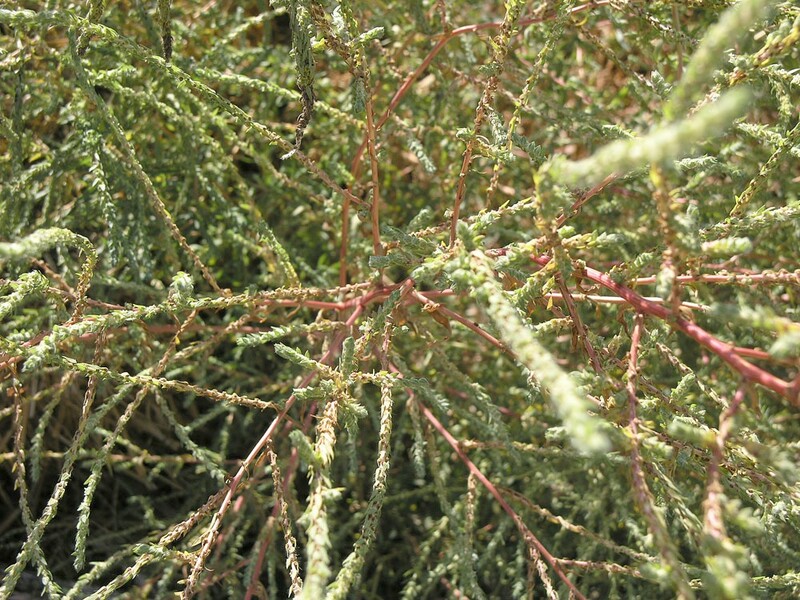 Neokochia californica (S. Watson 1882) G. L. Chu & S. C. Sanderson 2009 (“2008”). Mojave red sage. 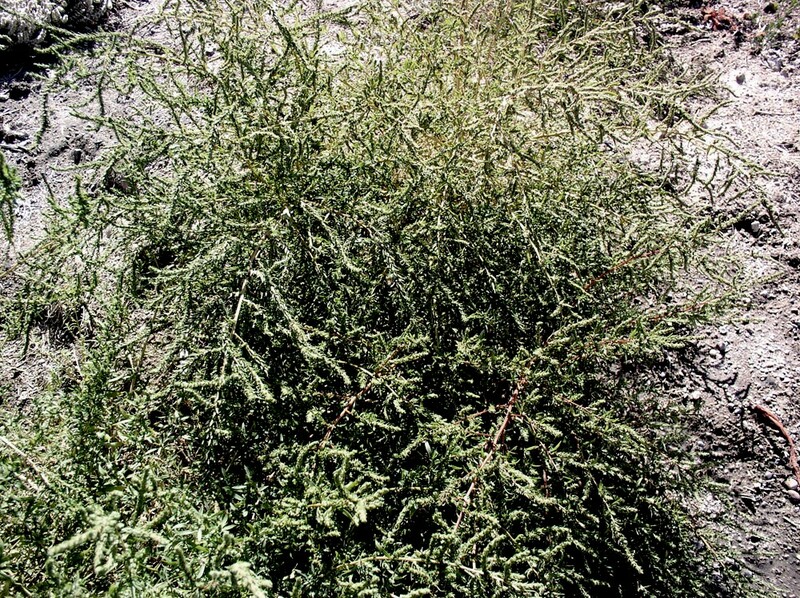 Subshrub to 60 cm, stems woody near base, mostly erect, covered with brown to gray hairs, branching regularly above base, branches ascending; leaves simple, fleshy, alternate, ±flattened, dark green, narrowly elliptic to sword- shaped, 5–10× longer than wide, to 20 mm long and 3.5 mm wide. Flowers May–Sep, small, apetalous, 2–5 in spherical clusters of leaf axils, each subtended by a scale-like bract on a short simple or branched scape, bisexual or unisexual; stamens 5; gynoecium 2-(3) carpelled with 2(-3) subulate stigmas; sepals 5, each expanded apically into broad horizontal veiny wing-like lobe in fruit, the fruit (gyroscopic diclesium) appearing more like a flower, enclosing the mature ovary (utricle). Of scattered occurrences in dry alkali lakes, San Joaquin Valley and Mojave Desert, Caifornia to southwestern Nevada. Type from western Nevada. Kern Co. Mojave Desert: “Rare on the subalkaline clay flats at Rosamond Dry Lake” (Twisselmann); Desert Wells (Purpus 1897, 1898); Indian Wells Valley, Lake Seep (Prigge 8 aug 1983); Mojave-Randsburg Region; Antelope Valley 60th Street at Avenue A, ~6 miles sw of Rosamond. San Joaquin Valley: Bakersfield (R. Rogers, 1897; Bauer, Sep 1928); Rio Bravo (Short & Johnson, Jun 1934). 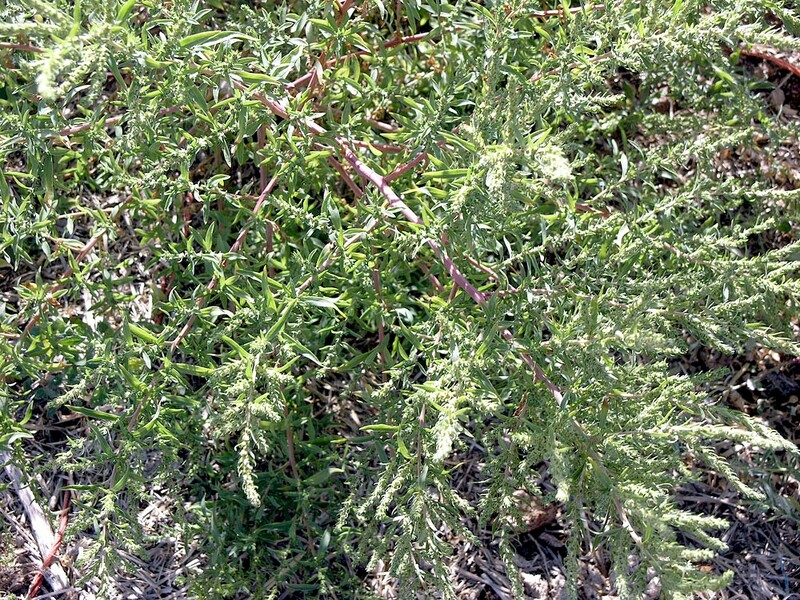 Occurring within the Suaeda nigra and Allenrolfea occidentalis alliances (MCV2) but not likely with Sarcobatus vermiculatus in Kern County. Difficult to grow from seed. 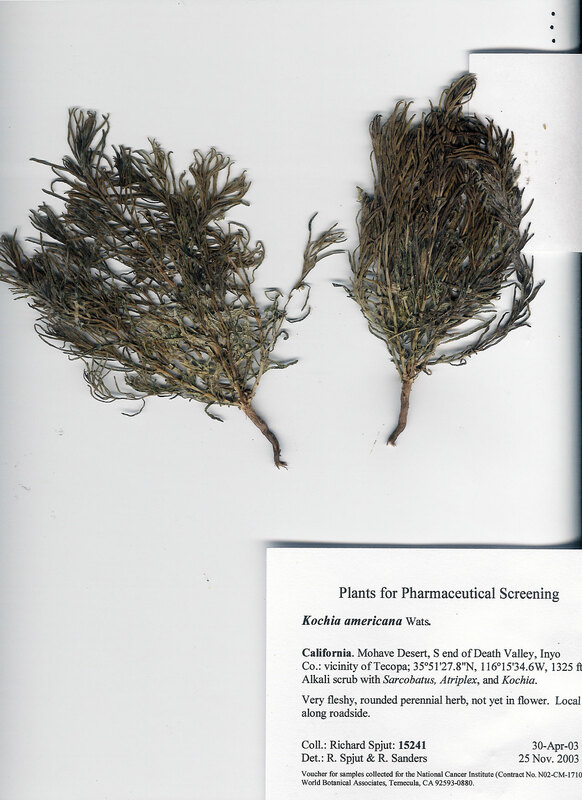 The genus includes one other species, N. americana (S. Watson 1882) G. L. Chu & S. C. Sanderson 2009, distinguished by branching at base, subterete leaves, and by less hariy leaves; a decoction of the plant used by the Navajo for treataing veneral disease (Moerman). Suaeda nigra, also similar to K. californica, distinguished by the sepals not expanded in fruit and by the leaves appearing waxy ((glaucous).